For the past decade I have been studying food web relationships between apex predators and their prey. The direct and indirect food web effects driven by apex predators, called trophic cascades, can touch many other species. Trophic cascades science is highly relevant in our rapidly changing world, because a system that contains apex predators tends to be higher in biodiversity, and therefore more resilient and capable of producing ecosystem services. For example, by killing and altering the behavior of their primary prey, elk, wolves can indirectly relieve herbivory pressure on some of the plant species elk consume, such as aspens. Aspens released from elk herbivory help stabilize streambanks and provide improved habitat for species such as songbirds. These complex relationships, strongly debated in ecology today, have inspired me to create and implemented three research projects and write two books and several scientific journal articles. Since 2008 we have been studying the complex dynamics of aspen (Populus tremuloides), elk (Cervus elaphus), fire regimes, and wolves (Canis lupus) in aspen and grassland communities in the elk winter range of Waterton Lakes National Park (WLNP) in the Crown of the Continent Ecosystem. Our work takes place in two WLNP sites: the Eskerine Complex Prescribed Fire, which burned 852 hectares in 2014; and the Y-Camp Prescribed Fires, which burned 835 hectares in April 2008, and 762 hectares in April 2015. These sites contain a very high elk density and an active wolf population. In North America, aspen have been widely observed to be declining over the past 70 years, but in WLNP, the opposite has occurred, with aspen cover increasing significantly over the past 70 years, to the point that it has encroached on ecologically important, at-risk habitat, such as fescue grassland. Aspen declines have been observed in sites where fire is used as a treatment to restore this fire-adapted species in the absence of wolves. In systems that contain wolves, elk spend less time in habitat that makes it difficult to escape wolves, thereby reducing browsing pressure on aspen. However, in the absence of a wolf population, elk browse aspen sprouts to death, resulting in little to no recruitment of young aspen into the forest canopy. Native grasslands have been declining in North America in general and in the WLNP foothills-parkland ecoregion since the 1880s. Ecologists attribute this to elimination of bison (Bison bison) and fire and to the introduction of non-native agronomic grass species. WLNP contains a large elk herd that between the years 1990 and 2015 fluctuated from 528 to 1,170 individuals, and is currently estimated at around 1,000 individuals (Johnston 2016). Fire increases resources for elk, improving forage as well as browse species by creating early-successional (called early-seral) habitat types. Fire could be used to increase carrying capacity for elk and bison in WLNP, since both species are drawn to post-fire forage, and in the case of elk, post-fire browse. Buffalo near Waterton Lakes National Park with mountain. Restoring free-ranging, wild, plains bison to the Crown of the Continent Ecosystem has been under consideration for nearly two decades, but more recently has become a possibility, supported by the Buffalo Treaty. Pending completion of the Environmental Assessment process, in early 2017 Parks Canada is reintroducing a herd of 12 plains bison to the eastern slopes of Banff National Park. Additionally, the Iinnii Initiative has been making strong progress toward establishing the policy and partnerships that would enable bison reintroductions in the Badger-Two Medicine area in Montana (where a currently captive herd of 89 animals sourced from Elk Island National Park, AB, is slated to become a free-ranging herd) and in the Chief Mountain area, which would include WLNP and the Blood Timber Limit. The Iinnii Initiative is encouraging a shift in the management status of this species at provincial and state levels in Canada and the US from “livestock” to “wildlife.” Currently the IUCN gives this North American species “Near Threatened” Red List status. In this trophic cascades study that took place from 2009-2013 on the High Lonesome Ranch, I was the principal investigator on a collaborative research team. My co-researchers included Michael Soule, Roger Creasey, and Trent Seager. We investigated the relationships between elk and cattle herbivory in a north-central Colorado aspen community. The aspen had experienced severe, long-term drought, and showed evidence of Sudden Aspen Decline. Additionally, wolves were in the early stages of recolonizing this system. This represented the first phase of longer-term research. Preliminary findings showed that elk were having a stronger negative impact on aspen in this landscape than cattle, and that aspen in high-elk areas were experiencing severe Sudden Aspen Decline. Aspen in areas of more moderate elk use were exhibiting greater resilience to stressors such as drought. For my doctoral research at Oregon State University, I studied trophic cascades in Glacier National Park, Montana (GNP), and Waterton Lakes National Park, Alberta (WLNP). I stratified my observations across three spatially distinct valleys: the North Fork Valley, in the western portion of GNP; the Waterton Valley, in the eastern portion of WLNP; and the Saint Mary Valley, in the eastern portion of GNP. All valleys are elk winter range, and had three different observed wolf population levels (Saint Mary: low; Waterton: moderate; North Fork: high), which represent three levels of long-term predation risk (the probability of an elk encountering a wolf). Ecological characteristics (e.g., climate, soils, elevation, plant associations) are comparable among valleys. Fire has occurred in 90% of the North Fork. My objective was to examine the relative influence of bottom-up (fire) and top-down (predation risk) factors and the context-dependence of these relationships via data gathered during a three-year time span. I found that trophic cascades were most pronounced in the North Fork, in study sites that had both wolves and fire in them. 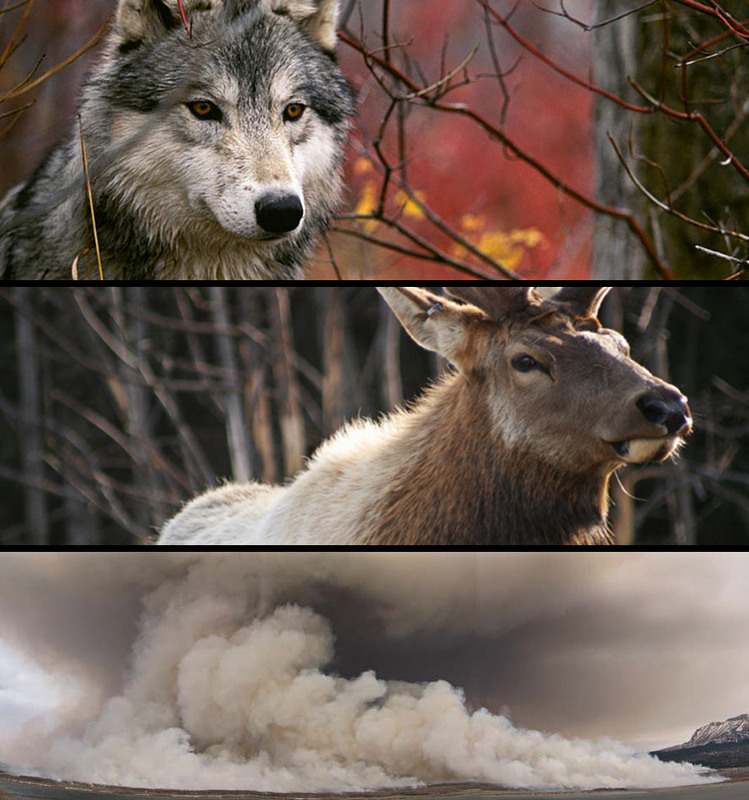 I concluded that top-down and bottom-up forces work together, and wolves and fire function as joint engineers of ecosystem health.